We know The MB SD Connect Compact 4 can connecting with Both Lan cable and WIFI, some customers might have question and problem about how to setting WIFI. OBD2TOOL share with you about WIFI setting on SD Connect C4. How to Setting Benz diagnostic tool MB SD Connect Compact 4 Star Diagnosis WIFI? Click wireless network icon to select “View Available Wireless Network”. 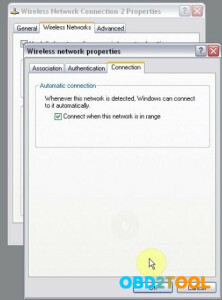 Tick on “Use Windows to configure my wireless network setting”. Cancel tick on “The key is provided for me automatically”. Go to Connection and tick on “correct when this internet is in range”, then click OK. Enter the network key and click Connect. Click the red circle in the menu bar. Select Configuration and then click Yes. 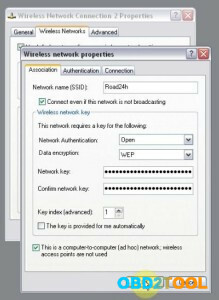 Select Encryption: WEP/Hex and enter the key (26 “a”s), then click Start. And you will see the network set just now is connected. If you have a MB SD Connect C4 wanna setting wifi or do not know how to setting WIFI, please can following with this instructions, hope it would help you. If you wanna USE SOFTWARE DIRECTLY , we recommend you buy the SD C4 plus DELL D630 Laptop package.